Spork at 1058 Valencia Street in San Francisco. Last Saturday night, my wife and I ventured into the San Francisco night to celebrate our one-year wedding anniversary. Our intentions were to go to the Front Porch, a cool Outer Mission southern style spot with a great new chef preparing awesome fried chicken (served in buckets) with sides and starters like oyster beignets, courtbouillion, and gumbo. Unfortunately, you can't make reservations with less than five people (who wants to spend your anniversary night with another couple and a fifthwheel?) and only ten percent of the restaurant is available for walk-ins. We knew we might have to wait a little bit, but we were shocked and awed to find out that some people got there at 7 p.m. that night and were still standing outside waiting for a table at 9 p.m.! We had a bottle of Dom Perignon chilled in my wife's purse and we didn't want that to warm up so we started our search for a cool place that was kind of romantic, not too expensive, and where we could get a table at 9 p.m. on a Saturday night. Ta-da! 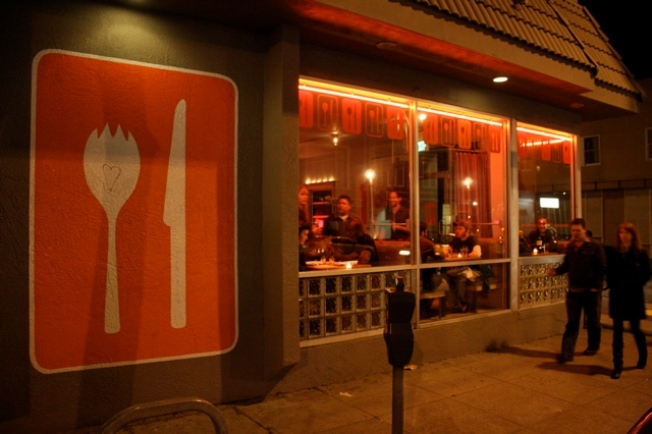 How fitting to find Spork, a former Kentucky Fried Chicken on Valencia Street that has been converted into a "low key, quirky atmosphere with really high quality food, yummy wines and eclectic beers." We only had to wait about five minuets, which gave us a chance to scan the place and read "The Story of Spork," a history on the back of their wine menu that explains how the place came to be with inspiration coming from the spork, the KFC-introduced utensil that combines the spoon and the fork (they sell a brand new, stainless steel version to take home, if you so desire). As an homage of sorts to the former establishment, they don't serve chicken. Their menu is small, but diverse, with seven first courses to choose from, and seven mains, and everything we had was great! From the goat cheese croquette with marinated beets to the ahi tuna poke, complete with complimentary home made pull-apart rolls which were amazing. My wife had the steak, a kobe bavette steak griddled to perfection with potato puree, shaved brussel sprouts and a very, very mild horseradish cream. I chose the roasted squash with gnocchi which far exceeded my expectations. I've always been a fan of the San Francisco clam chowder bread bowl, and I didn't realize that this was like a classy dinner version of it. A plate came out with a halved roasted acorn squash filled with kale, green lentils, black trumpet mushrooms, housemade gnocchi, spinach and toasted pecans. After eating the contents, I then could eat away at the squash, like I do with my bread bowls. Awesome! I would say the proportions were in-between what you would get a Luna Park and Delfina, with the prices far closer to Luna Park's. We didn't get any dessert, because the apple crisp that we wanted had just sold out, and we were comfortably filled, but, a return trip may be in order to sample the "After School Special" which is a custom ice cream flavor featuring "intense vanilla with chocolate covered potato chips and caramel," or "Elvis has left the Building - a warm peanut butter cup, vanilla gelato, bananas, caramel and salted peanuts."